PeonySoft Video to MOV Converter is a powerful Video Converter which can convert all popular types of video to MOV format, like AVI, FLV, WMV, ASF, 3GP, VOB, MPG/MPEG, MP4, RMVB, etc. You can also extract and convert the audio track from your video files to MP3, WAV and M4A. ...... set video output parameters, apply video effects, capture pictures from your video, and so forth, only a few clicks to complete. 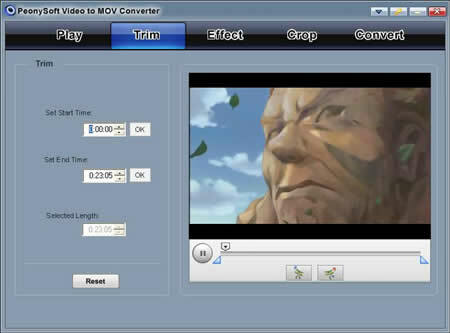 PeonySoft Video to MOV Converter is easy-to-use to finish your conversion with high speed and excellent quality. Free download this powerful Video to MPEG Converter and enjoy your wonderful digital life experience! Qweas is providing links to PeonySoft Video to MOV Converter 2.2.1 as a courtesy, and makes no representations regarding PeonySoft Video to MOV Converter or any other applications or any information related thereto. Any questions, complaints or claims regarding this application PeonySoft Video to MOV Converter 2.2.1 must be directed to the appropriate software vendor. You may click the publisher link of PeonySoft Video to MOV Converter on the top of this page to get more details about the vendor.